How do you introduce a city so casual and laid-back yet so worldly and sophisticated? Over the last 100 years this community of just four-square miles has witnessed dramatic change. From the beginning, with the exception of sparse industry, the town has always been thought of as a residential community. Lovely blooms of wild flowers; Lupines, Indian paint brush, Mustard flowers and small bushes were touched by bright sun rays as they sat on the sand dunes and warm breezes caressed the sparkling beach. This peaceful scenery had greeted local Indians and in 1769, the Spanish soldiers, who came to colonize California. In the late 1880's the first visitors to Manhattan Beach were also enchanted by the same environment. The topography of the sand dunes changed and the architecture was determined by the needs of those who made the decision to live in an area lacking improvements. Prior to 1901, with deep sand, no streets and few houses the population was sparse, however there were those who battled the dunes in order to camp, fish, dig for clams and enjoy the uncrowned landscape. Now and again one might see, a tent with dirt or wood floor, pot belly stove for heat and curtains to separate the living quarters, perched upon a sand dune. With the arrival of the Atchison, Topeka and Santa Fe Railroad in 1888, and the Pacific Electric "Red Car" in 1903, the area began to take on a different appearance. With better transportation more people could live year round near the shore, yet work in the city of Los Angeles or in other parts of the Los Angeles basin. The first subdivision of the community took place in 1901, defining the downtown area, creating development patterns that are reflected today. In the 1880's and 1890's, northwest lumber companies shipped large quantities of lumber into the Los Angeles area, making ninety percent of the homes in Manhattan Beach constructed of wood rather than traditional materials such as adobe or sand bricks. As construction took place architecture began to change from the original beach cottage to more substantial buildings. The art of pure design could be seen throughout the community, through the talent, and influence of architects and builders, whose work changed the shadows on the dunes. 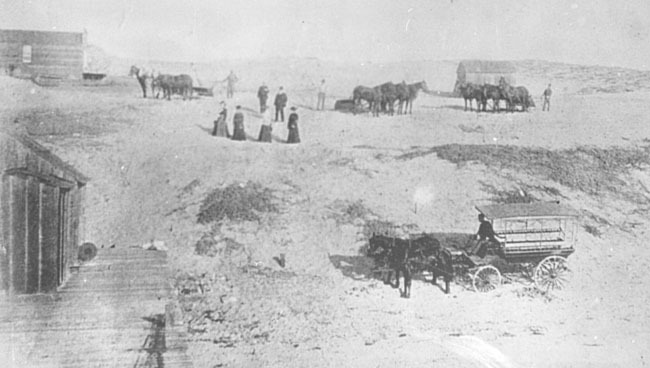 Life on the dunes proved to be a challenge compared to life style in Los Angeles, Pasadena and other more settled areas in the South Bay. The sand drifting to the window ledges like snow, it could be hostile and walking in the deep sand could become almost impassable. By 1905, board sidewalks had been installed in what is now the downtown area, making foot-travel easier and safer. It would be several years before a house had indoor plumbing, gas, electricity or running water, however, oil and water could be purchased by the barrel from the local general store.